For the first time since the mid-1990s, we had two teams last season that lost in their respective conference championship game in a year both return to those same title games the following year. After the 2011 regular season, the San Francisco 49ers were defeated by the New York Giants in the NFC Championship Game. They returned to the title game this past year to face the Atlanta Falcons and defeated the Falcons to reach the Super Bowl. Also after the ’11 season, the Baltimore Ravens lost to the New England Patriots in the AFC Championship Game. The Ravens got another shot at the Pats in this year’s AFC title game and beat them on their way to becoming the eventual Super Bowl champs. 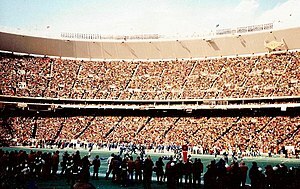 The 49ers and Ravens were the eighth pair of teams in the history of the NFL playoffs (since 1966, the Super Bowl era) to return to the conference championship games after both losing in them the previous years. The other times it happened: Cleveland and Oakland (both lost in conference title games in 1968 and then played in those title games the following year); L.A. Rams and Oakland (1974); L.A. Rams and Oakland (1975); L.A. Rams and Houston (1978); Dallas and San Diego (1980); Washington and Cleveland (1986); Dallas and Pittsburgh (1994). * The Chicago Bears and New York Jets were the conference championship game losers after the 2010 season. Neither team made the playoffs in 2011. That was the fifth time in history that both conference championship game losers failed to make the playoffs the following year. The other years that happened: 1985, 1989, 1991 and 2005. * Sixty of the 92 conference championship game losers made the playoffs the following year, 32 did not. Of the 32 teams, the New York Jets have missed the playoffs three times after losing the conference championship game the prior year. Nine teams have done this twice: Cleveland, L.A. Rams, Chicago, Carolina, Minnesota, Oakland, Pittsburgh, Miami and Denver. * Nineteen teams have lost the conference championship game in consecutive seasons. The Jets did it in 2009 and 2010. The last NFC team to lose consecutive NFC title games? The Philadelphia Eagles. They lost NFC title games in 2001, 2002 and 2003. The other teams to lose three straight conference title games are the Los Angeles Rams (1974, 1975, 1976), Dallas (1980, 1981, 1982), Oakland (1968, 1969, 1970) and Oakland (1973, 1974, 1975). * Nine teams lost a conference title game in a season and then won the Super Bowl the following year. The Baltimore Ravens became the ninth team to accomplish this feat this past season. The others: San Francisco (1983), Chicago (1984), Washington (1986), San Francisco (1993), Dallas (1994), Green Bay (1995), Oakland (1975) and Pittsburgh (2004). * Five teams lost a conference title game and then lost in the Super Bowl the following season. The San Francisco 49ers this past year became the fifth team when they lost last year’s Super Bowl to Baltimore after losing in the NFC Championship Game the previous year. The others: L.A. Rams (1978), Philadelphia (2003), Pittsburgh (1994) and New England (2006). * The Ravens and 49ers became only the second set of teams in history to both lose the conference title game in one season and then face off against each other in the Super Bowl the following year. The only other time that happened was in 1994 when Dallas and Pittsburgh lost conference title games and then played each other in the Super Bowl the following season. * Six of the last nine teams that lost in the NFC Conference Championship Game failed to make the playoffs the next season.